1950 Back in the world of politics, the army's chief medical officer, who was an ex-officio member of the City Council, made an important announcement. Undesirable objects from the local sewage had found their way into the harbour area. The elected members, of whom Gibraltarians were in a majority, told him he was mistaken. The colonel took umbrage and at the first opportunity took a swim in the harbour and captured one of the offending specimens in a jar. On the 25th of June The Korean War began. 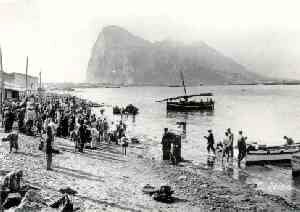 Other than an increase in the number of warships passing through on their way to the conflict, the war had little economic effect on Gibraltar. There may have been some nervousness, however, when General MacArthur was defeated by the Chinese at the Yalu and President Truman considered the possibility of using atomic bombs to stop them overrunning the peninsular. 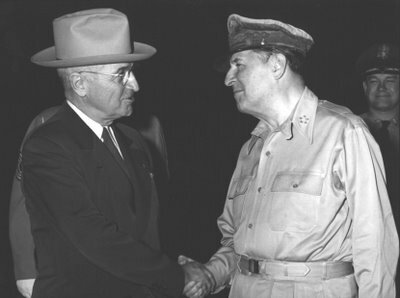 Harry S. Truman and General Douglas MacArthur. In the end he was persuaded not to, and World War III did not take place. Instead, that same month in Gibraltar, the Legislative and Executive Councils were finally created. In both, the elected representatives of the community were numerically balanced by Colonial officials and members nominated by the Governor, who, to make doubly sure, could also veto both councils. Democracy, it seems, had arrived in Gibraltar and to reinforce the point the councils were inaugurated by the Duke of Edinburgh. Despite its limitations, a Constitution of sorts had been defined. The changes caused alarm in Spain as the procedures were the recognised first steps of British colonies towards self government. The voting system used was one of proportional representation and I was soon treated to endless incomprehensible school lessons on the finer points of the PR system. The idea behind the use of this voting method was to prevent an elected majority of any one party. The AACR, however, cleverly saw through the device and instructed the voters accordingly. On another occassion Joshua Hassan, who had a very high pitched voice, was addressing the electorate when a heckler interrupted him with a loaded question, rounding off his broadside with a personal insult. 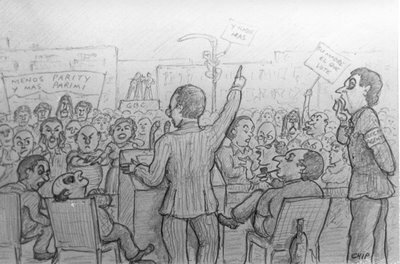 A political meeting in Gibraltar. The platform member second from left leaning backwards is Sir Joshua Hassan C.B.E., M.V.O., Q.C.,J.P. 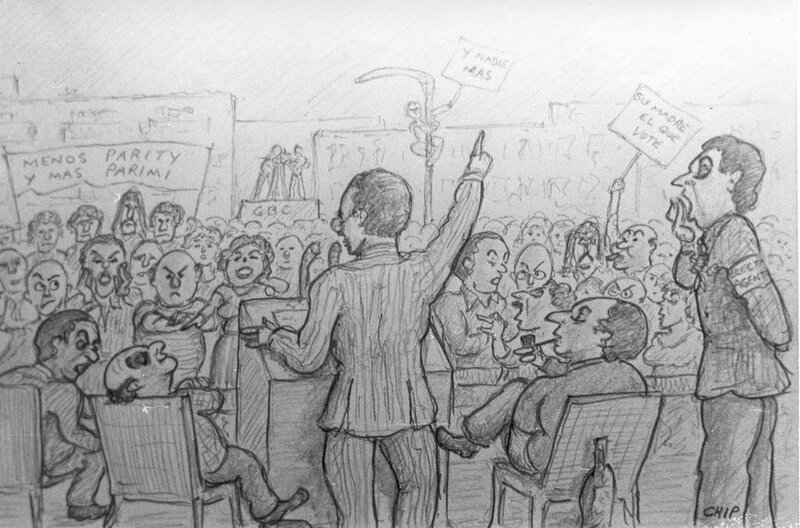 The hoi polloi often referred to him as ‘Ese Hassan con tanta letra’ detra su nombre.’ He would one day become First Minister in Gibraltar’s House of Assembly The cartoon is one of several drawn by Eric Chipulina for a series of articles called ‘A Short Expedition into the Gibraltarian Mind’. It was published in the Gibraltar Chronicle. The AACR duly won the election and inherited two main sources of revenue: import duties and the Gibraltar Government Lottery. They themselves introduced a trade tax on business profits. Not unexpectedly, the legislation proved unpopular with the rich. There was still, however, no income tax at all. 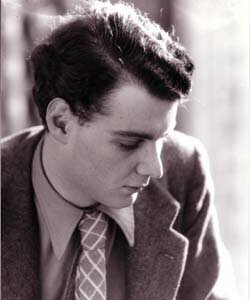 It was around this time that Guy Burgess, Executive Officer of the British Foreign Office, arrived in Tangier on leave to recover from concussion after a drunken brawl in Chelsea. For a man who was supposed to be a diplomat he seems to have been unbelievably indiscreet. He made no effort to disguise the fact that he was gay and drank himself into oblivion with monotonous regularity. He enjoyed loudly expounding his Marxist political views in the local bars, and ended up insulting almost every important member of the British colony in Tangier. 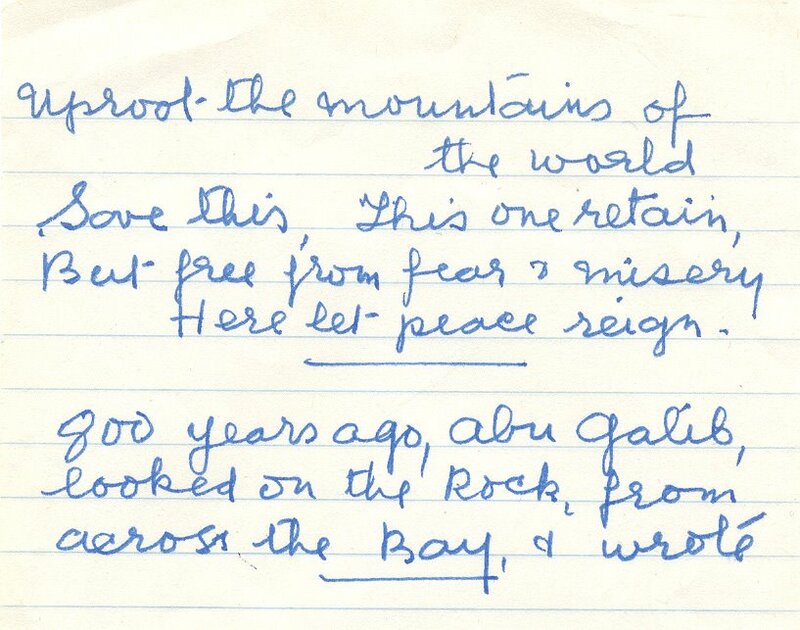 When he eventually came to Gibraltar he stayed at the Rock Hotel and continued where he had left off, leaving behind an unpaid bar-bill of £400. Indignant reports reached the Foreign Office, but he somehow avoided being dismissed. A year later he defected to Moscow with his fellow diplomat Donald Maclean. Urged on by the Franco regime, but on the whole willingly rather than through fear of the consequences of disobedience, the Spanish press began to campaign seriously for the return of Gibraltar. Their opening salvoes attributed a murky ancestry to all Gibraltarians and suggested that almost all of them were involved in criminal activities of one sort or the other. The Gibraltarians, insecure and hyper-sensitive after their war experiences, were understandably both infuriated and hurt. Spain's misguided and counter-productive strategy during this period probably lost them whatever chance they ever had of winning over the community. 1950 Soon enough it was May once again and summer was just round the corner. 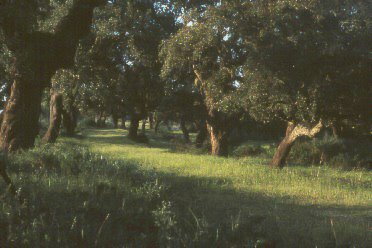 It was time for the Gibraltarians to forget about Franco and the Spanish press and concentrate on the annual excursion to la Almoraima, an area covered in oak cork trees near San Roque. Originally the trip had been a pilgrimage to the scene of an old hermitage where an apparition of some sort was supposed to have occurred. With the passage of time the trip had lost its religious overtones and was now just a good excuse for a day out in the countryside. Bus load after bus load set off early in the morning everybody singing well known songs and warming up for a whale of a time. Many a pregnancy out of wedlock could be traced back to la Almoraima despite the fact that it was not quite the kind of place one would associate with such romantic passions. The place was always far too crowded for that sort of thing and in any case traditionally it usually rained. La Almoraima the cork wood near San Roque. It was also quite common to make the trip on horseback. The horses were hired in Campamento, close to the beach, and were ridden along a well trodden route all the way to the woods. It was a considerable distance and the horses, which were usually well past their sell-by date, were often extremely reluctant to make the trip. The very opposite was true of the return journey. The old nags seemed to sense that they were heading back to their stables and it was often very difficult to restrain them. This was especially true of the last long stretch along the beach. An old postcard showing fishermen landing their catch on the beach at Campamento. On one occasion, I was involved in a rather nasty incident when I was returning from one of these trips with a large group of friends. As the horses stepped on to the beach after a long day away from home, one of the riders lost control and his horse broke into a wild gallop. Then another horse, sensing his moment had arrived, also took the bit between his teeth and charged after it. Within seconds all the horses were thundering down the beach completely out of control. We must have looked like desert Beduins on horseback aping the charge of the Light Brigade. Unfortunately for us, a young local happened to be walking across the beach at that precise moment. By the time the sand had settled, the young lad was flat on his back screaming his head off. Eventually the horses were brought under control and we were surrounded by furious villagers. For more than a few minutes it seemed that nothing less than a good old mass lynching would calm them down. Luckily, the little boy had come out of the experience relatively unscathed and his screams had more to do with shock than from any physical injuries. In a very short while the police appeared on the scene. 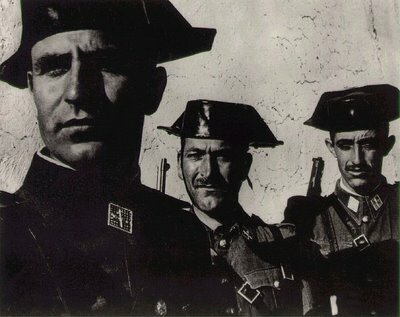 To give them their due the uncompromising Guardia Civiles, were just as unpleasant with their own countrymen as with the terrified Gibraltarians. In the ensuing fracas I was extremely lucky to make my escape and returned immediately to Gibraltar, It was the last time I ever visited la Almoraima. Some of my friends were less fortunate and were forced to spend the night at the local police station. The Guardias had decided that taking them away was their best protection against the fury of a mob still hell bent on revenge. Meanwhile in the peace and quiet of 256 Main Street Eric's bedroom had now been moved to the attic. His grandmother had her bedroom on the floor directly below it. One night the old lady got up from bed, tripped or slipped, sprained her arm in the process and found herself stranded on the floor unable to get up. Somehow or other, her rather feeble cries penetrated Eric's consciousness, a fact which in itself was worthy of comment as Eric was renown for being a very heavy sleeper. He went down to her room, found her lying on the floor, picked her up and put her back in bed, giving her an aspirin or two to calm her down. For weeks after the event Eric was the family's reluctant hero as Maria Luisa (2.4) made a meal of the whole affair, endlessly and embarrassingly retelling the incident to all and sundry. He had performed an act of heroism over and above the call of duty. In a sense the episode confirmed what Lina had always told her eldest son. 'Tu eres el chirri de abuela, eres el unico que la entiende'. According to Eric this wasn't quite true. It was just that by temperament he was less susceptible to Maria Luisa's (2.4) remorseless needling than any other member of the family. There was one other incident, however, which had it been allowed to develop, would have strained even Eric's normally placid relationship with his beloved grandmother. Late one evening, Eric and Maruja came back home with some friends and entertained them in the living room. At that time this room was located just across the landing from a bedroom shared by my grandmother and me. Soon enough the comfortable murmur of voices and the odd clinking of glasses could be heard through the walls as the guests settled down for a chat and a few drinks. The good lady, in bed but still wide awake, could restrain her curiosity no longer. It was time to intervene. To my horror she rose from her bed and walked out into the landing carrying what was euphemistically called a spittoon or escupidera but was in fact her very recently used chamber pot. She was determined to barge into the living room with this little offering intent on embarrassing everybody in the room. Thankfully I was up to the occasion, and to my everlasting credit managed to scramble out of bed, stopping her just as she was about to open the door of the living room. The following day when all was revealed to the rest of the horrified family, I was duly awarded the Victoria Cross. Shortly afterwards Eric repaid his debt to his younger brother. When I opened my eyes on Christmas day I found myself staring at a beautiful tiny wooden replica of HMS Hood. My brother had lost none of his teenage modelling skills. 1951 The practice of periodically dosing children with castor oil persisted. Many young people of the day must have developed an intense dislike of orange juice, as parents used to mix it with the castor oil in a hopeless attempt to make it more palatable. It not only made it worse, it also increased the volume of liquid one had to drink. On one unforgettable occasion Eric came home early from work only to be faced with the fact that it was his turn for a dose. His stomach visibly heaving and his face turning greener by the minute he suddenly turned tail and left the house. Minutes later he returned with a jaunty gait and a smile on his lips. Giving the cat a passing pat, he bid everyone a good evening as if nothing was amiss and strode purposefully towards his mother who had been left holding a spoonful of the stuff. He downed it without a moment’s hesitation in a single gulp. It had been yet another act of supreme courage. In February a party of 29 repatriates left London heading for Gibraltar overland. Their arrival closed a chapter in the history of Gibraltar. The repatriation programme was officially over. Of all the Gibraltarians evacuated, only about 2 000 chose to stay in Britain permanently. 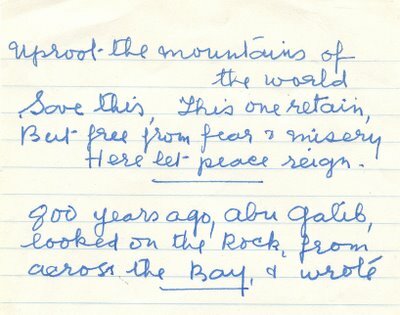 The above was written by my mother and is taken from a poem by Abu Abd’alath Muhammad Ibn Galib, a twelfth century Moorish poet. The second part of Abu’s plea must have fallen on deaf ears.